The St George Orthodox Ministry is a new service, formed under the supervision and guidance of His Grace Bishop Angaelos of the Coptic Orthodox Church. The St George Orthodox Ministry is intended to support the development of English language communities reaching out to the wider British population. Father Simon Smyth, Father Peter Farrington and Deacon Antony, with other members of the diaconate and laity are serving in this ministry, which is working in the towns of Stoke, Swindon and Portsmouth. The St George Orthodox Ministry is supporting the development of the Coptic Orthodox Community of St Chad in Stoke, of St Martin in Swindon and of St Mary and St Moses in Portsmouth. Father Peter Farrington is from an evangelical protestant background and became a member of the Coptic Orthodox Church in 1994 after spending several years seeking an understanding of the Orthodox spiritual and theological Tradition. He had trained for ministry within the evangelical movement, including several months in Senegal with evangelical missionaries. He has never lost his desire to see British people come to a deeper and more transforming experience of life in Christ and now, as one of the priests serving the St George Orthodox Ministry, he is seeking to share the Orthodox life with all who are interested. Father Simon Smyth became a member of the Coptic Orthodox Church in 1994, and was ordained a priest of the Coptic Orthodox Church in 2000, before being honoured with the rank of Hegoumen in 2009. Deacon Antony Holland had been serving in the communities in the Orthodox communities in Bournemouth and Portsmouth, and was ordained a Deacon of the Coptic Orthodox Church in 2015. He is now serving especially in the community of St Mary and St Moses in Portsmouth. 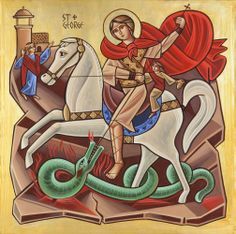 St George is the patron saint of England, and a very popular saint of the Coptic Orthodox Church, therefore it is entirely appropriate that this new missionary ministry in the UK should be placed under his patronage. May his intercessions be with all those involved in this ministry and supported by its efforts.